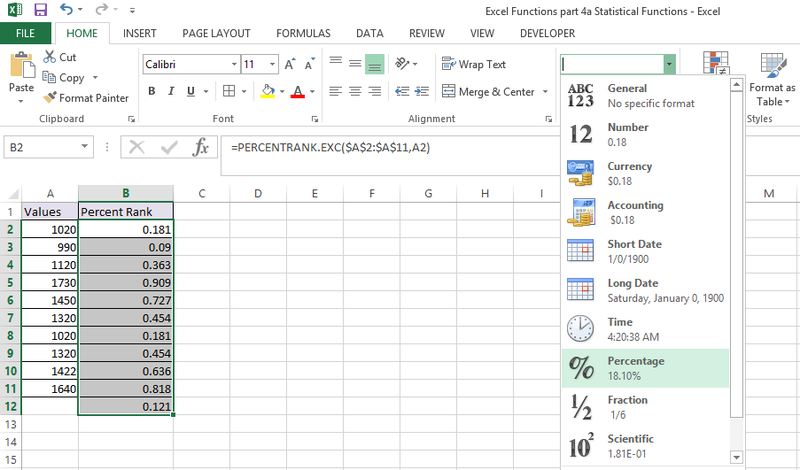 PERCENTRANK.EXC Function in Excel calculates the relative position of a specified value i.e., rank of specified value in terms of percentage between 0 and 1 with both values are exclusive, within a set of values. array – The array of values within which you want to find the relative position of a specific value. x – The value for which you want to calculate the relative position (rank as percentage) of. [significance] – Number of significant digits that the returned percentage value is rounded to. (By default the returned percentage value is rounded to 3 digits). 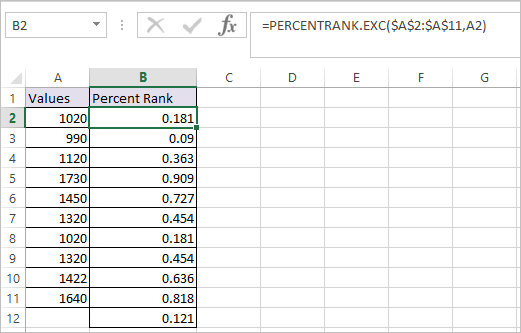 The above PERCENTRANK.EXC Function in Excel, calculates the rank of values in terms of percentage between 0 and 1 with both the values are exclusive. If the value is not found in the array, the array values are interpolated to calculate the percentage rank. 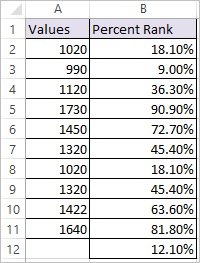 In Row number 12, value 1000 is passed as an input x, so the percentile rank is interpolated to 3.7% for value 1000. The supplied array is empty. #N/A – Error occurs if the supplied value of x is smaller than the minimum, or greater than the maximum value in the supplied array.